This couple got engaged in New York and included many New York details into their wedding. 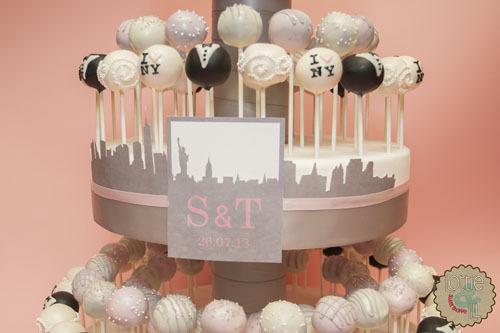 Continuing with their theme, the New York skyline was incorporated into their tiered cake pop display. In addition to the wedding color pink and grey cake pops, designer I Love NY cake pops were mixed with bride and groom cake pops. For an extra adorable touch, the top mini bride and groom cake pops had their favourite sport team jerseys as well! This entry was posted on Monday, March 31st, 2014 at 8:56 am	and is filed under Wedding Pops.